After a morning spent in the garden weeding and picking beans, the dancer declared that she wanted to make a cucumber raspberry salad. 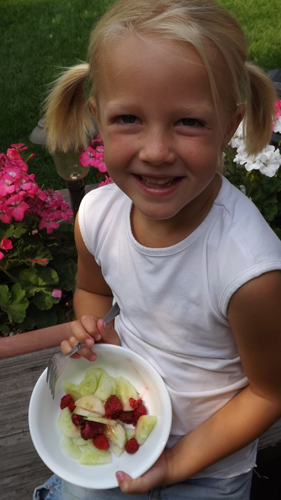 She gathered, cut, washed, and tossed her beautiful salad…and here she is enjoying it. Yes, she ate the whole bowl. I guess we’ll have to add it to the menu. Annaclaire, you are a good cooker girl! That looks like a great salad! I’ll have to have you make one for me!